One main difference between the two drills bits is that with the RCB the bit and the outer core barrel turn with the drill string. The RCB barrel is made of 2 parts: an outer core barrel and an inner core barrel. The RCB inner core barrel is dropped from the surface without a line attached and free falls trough the drill string until it lands in the bottom hole assembly (BHA). The RCB bit and the outer core barrel rotate with the drill string while the inner core barrel remains stationary. The main bit turns the core which does not rotate inside the inner core barrel as it is cut. The inner core barrel is retrived by a wireline when the core has been cut. 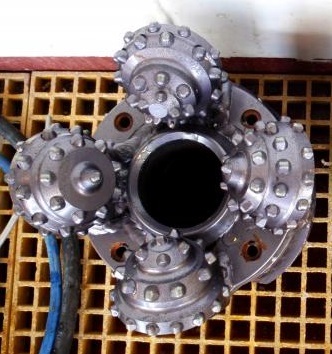 This is a much faster method of coring than the conventionnal system often used in oil industry. With a conventional coring system, the core barrel is attached to the end of the drill string. Cores are recovered by moving the entire dill string up to the rig floor and back down to the bottom of the hole (called tripping). But here, we are in more than 4 km of water and we have to drill into ~1 km of sediments. Using this system of retrieving each core would be very slow and take many over 1/2 day for each core. On the JR, once we have cut the core by drilling ahead the desired amount (usually 9.7 m), the drillers drop sinker bars down the drill string to the top of the core barrel. These lock onto the upper end of the core barrel called the “pulling neck”. Then, the drillers pull the core barrel back up with the wireline. Once the core barrel is on the rig floor, the core liner, a plastic tube containing the core of sediments and rock, is removed and carried onto the catwalk where it is inspected, gas measurements are taken, and it is cut into sections before analysis and sampling.